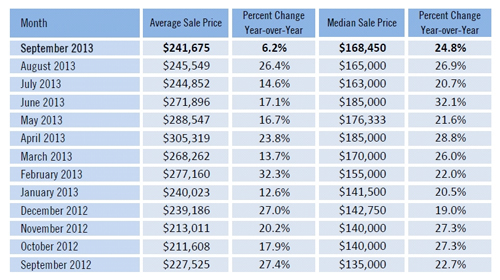 For the 3rd month in a row median sales prices increased in SW Florida. Median sales prices are up 24.8% over last year so it’s safe to assume all properties in SW Florida are sky rocketing, right? Not so fast. Media prices county-wide are increasing, but that doesn’t mean every property is going up. Average sales prices are coming down. Since April the average sales price is down about $60,000. So how can two sets of data tell two very different stories? The answer is, they’re not telling two stories. Average sales price is influenced by high end sales. If there are several multi-million dollar sales it can skew the average up. When using the median price, it really doesn’t. Let’s say for example there are 10 sales of 5 million dollars+. That’s at least $50 million in sales in just those 5 sales. By using the average, that adds $50 million to the total number, but by using the median it just counts as 5 sales at the top. Remember, median sales are the number in which half the sales occur at or below a certain price and the other half are at or above that price. When we use average they all get thrown in together and divided by the total. The average price is more seasonal because that’s when our high end buyers are visiting Florida and purchasing higher end homes. This is why you’ll always see the peak of the average market around March-May. They typically go to contract January through April and close March through May, sometimes even June. Realtors like to use the median price because it’s more stable and less affected by a few sales. Median prices have been fairly constant to the upside. Even the median can have fluctuations if certain closings get delayed. A government shutdown for instance could delay certain types of loans which would disrupt closings. One year we had flood insurance coverage lapse and we couldn’t close until the program opened up again. Speaking of government shutdown, the government is open since last time we wrote an article. Yeah!!!! Don’t hold your breath though as we might be right at it again in a few months. November is shaping up to be a big month for the Ellis Team. Let’s hope that’s indicative of the entire market. Buyers have been particularly active in recent months. October has been a good month too, but November is shaping up to be fantastic. Inventory is on the upswing, which is good. We need more inventory to sell. We’ve even been going out to developers and builders looking over their inventory as sometimes we just don’t have much to sell in certain price points with certain features. If you’re considering selling, now might be a good time to call us. 239-489-4042 We recently listed a home that was previously on the market but failed to sell with another Realtor. We raised the price and marketed it using our advanced marketing system and it sold in 19 days. If you price it correctly and market it where the buyers are, it should sell today. Call us while prices are rising and before interest rates creep up next year. Good luck and Happy Home Selling! Posted in Cape Coral, Cape Coral Real Estate, Fort Myers, Fort Myers Real Estate, Southwest Florida Real Estate.Tagged 239-489-4042, Cape Coral real estate market, florida home sales, Fort Myers real estate, SW Florida properties, SW Florida real estate, the Ellis Team.